IT WAS Queensland Country Meats' affair on Saturday evening at the Maranoa Business Awards night as they secured a hat-trick worth of awards. The butchery team were awarded overall 2018 Business of the Year, Large Business of the Year and Retail, Wholesale and Distribution Business of the Year. Owner Paul Lavelle and his wife Vanessa were left speechless after receiving three trophies. "We give a lot back to the community in respect to sponsorship, community groups and giveaways, so I think the commerce awards was looking more at what we do for our local community and I think it is pretty endless here,” Mr Lavelle said. "It is really nice to be recognised for all our effort. "First of all we were awarded the Large Business of the Year, which has more than 10 employees. We would have been stoked with just winning that but we were then awarded the wholesale and distribution award, which was a massive bonus. Mr Lavelle and his wife moved to Roma in 2001 when the business was originally owned by a company from Toowoomba. In 2006, they decided to purchase the business and so the top-quality store of Queensland Country Meats was born. "When we first started out we only had two and a half employees with a casual, a butcher and myself,” Mr Lavelle said. The team at Queensland Country Meats pride themselves on giving back to the community and sourcing locally. "To win the overall award is a big step forward for us and gives us the confidence that we are doing the right thing,” Mr Lavelle said. "I think sometimes we underestimate our business, but truth beknown we have set it up by doing systems and employing the right staff and making sure they are being looked after to make sure we have a solid foundation to work off. "We also make it our aim to deal locally where we can. All of our lambs and body beef are bought locally. 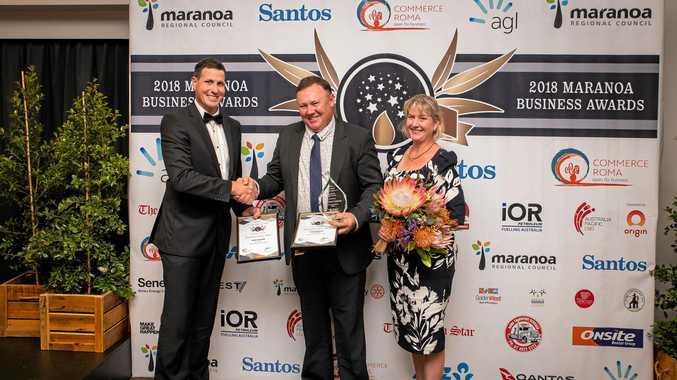 President of Commerce Roma Cyril Peet said this year's Maranoa Business Awards were outstanding, in both presentation and this year's award nominees. "It is awesome to see local businesses going the extra mile to make Roma so great,” he said. "One of my drives is to encourage business to do better and make Roma more of a hub for the southwest. Mr Peet said next year was already shaping to be another successful awards night with this year's new category, employee of the year, having plenty of positive feedback.